The long cold spell this winter held the snow in check, but once the cold spell broke, the melt caused major flooding in areas across CRST. According to Director of the CRST Department of Transportation Dakota Longbrake, damages to roads on the reservation are likely to meet minimal estimates to warrant assistance from other agencies, in particular from the Federal Emergency Management Agency (FEMA) and the Emergency Relief for Federally Owned Roads (ERFA). BIA 3 is currently closed from the Moreau Bridge to the Promise Junction. Longbrake said he was not sure when it would be opened back up for travelers. In some spots, he said there are 4 foot drop-offs and the road is not safe to travel. While Longbrake is still working on initial estimates of damages on CRST roads, he said there are 5 to 6 stretches along different areas of BIA 3 with serious damages, a few stretches at or exceeding 2,000 feet and the shortest stretch reaching 85 feet. BIA 3 was surfaced with a chip and seal, and prior to the flooding, plans were already in place to resurface the road with chip and seal again, but to use an 8 inch think soil stabilization product underneath. This type of road is more common in the south, and its use in northern areas is still experimental, but its price is one-third the cost of asphalt and is expected to have a 15-year lifespan, just short five years of the life-expectancy of an asphalt road, Longbrake said. If funding comes through FEMA and ERFA, these agencies will only fund replacement costs of damaged roads, restoring them to pre-flood conditions. 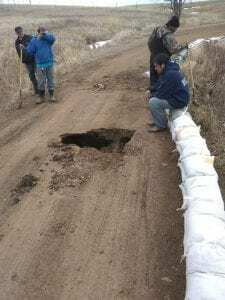 Longbrake said he will still need to follow through with the original plans to resurface BIA 3, and that they are likely to use gravel to make damaged roads passable until resurfacing can take place. Other roads that have been damaged by recent weather conditions are BIA 2,BIA 7, BIA 18, and BIA 8 (Armstrong Rd. ), but these roads are not as bad as BIA 3, Longbrake said. Longbrake said his department is still assessing damages, and he has not received any damage reports of West End Roads, but he will not know for sure until he is able to get to each road and survey the possible damages. The BIA officials planned a visit Wednesday to help assess damages and estimate costs. 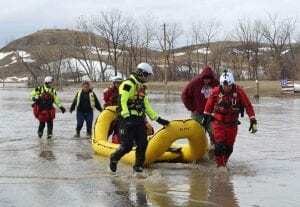 Once those estimates are in place, the other agencies will send their people out to write up official assessments before any funds can be issued and work begun, Longbrake said. Longbrake warned that it may be awhile before BIA 3 is restored for regular use. Alternate routes out of White Horse are west on BIA 2 and north to Timber Lake. BIA 7 to Swiftbird can be taken out of Promise or travelers use Red Top Road north to Mobridge, Longbrake said.